Spray 12-inch skillet with cooking spray; heat over medium-high heat. Add onion, bell pepper, eggplant, garlic and pepper. Cook 8 minutes, stirring frequently, until vegetables are tender. Stir in broth and wine; cook 1 minute. Stir in pimientos and chicken; heat until hot. 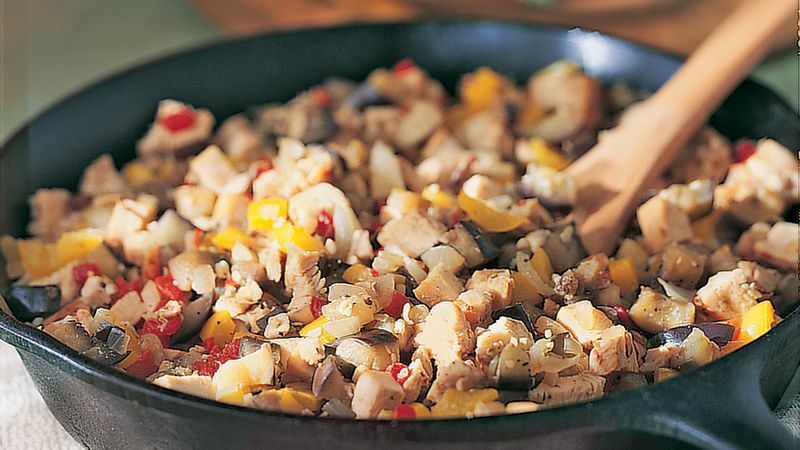 This chicken and veggie medley is a simple one-skillet supper, but you can also wrap the mixture in flour tortillas to make burritos, or use it in a frittata.